Success for Jonny and Pete! It’s all happening at The Falmouth Sports Club! Jonny Newton, seeded 2, won the Falmouth title beating top seed Martin Thompson 3-1 in the final of a superbly run Championships. Both players put on a fine display of attacking squash for the assembled crowd with Jonny’s 16-14 third game ‘steal’ proving crucial. In the Plate it was the in-form and much-improved Peter Keam (the slimmer!) who beat team mate Christian Thomas in an equally attractive match. Both Falmouth teams are doing well in their respective divisions this season – great to see strength and depth returning to the famous club. 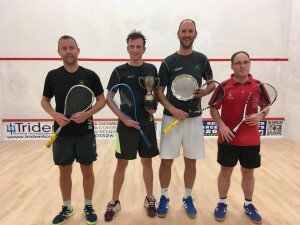 The main results have been uploaded to Squash Levels.